The agricultural industry received a welcome boost from the resounding success of the Borderway Agri-Expo event, held on Friday 2nd November at Borderway, Carlisle, Cumbria. The event attracted an estimated 5,000 visitors who were amazed by the quality of cattle and sheep on show along with the presentation of machinery demonstrations, breed society and trade stands which totalled nearly 120 exhibits. Operations Director David Pritchard commented ‘the day has been absolutely fantastic. It is a credit to the beef and sheep producers who have exhibited their animals and it demonstrates the high quality of stock in the UK. Despite the recent difficulties of the blue tongue disease and protection zoned areas, over 130 head of cattle were forward for the show and over 60 consignments of prime lambs were also forward for judging. “We have received some most favourable comments that this event was greatly needed for the north west area and there is no better place than the premier livestock centre of Borderway to stage it. One of the highlight of the day was the livestock judging. In the cattle classes the top accolade of the day went to Tecwyn Jones of Ty Newydd, Llanrwst, Conwy with his heifer Black Beauty. Cattle judge, Jimmy Mulholland of Great Orton, Carlisle congratulated the exhibitors for their presentation of high quality stock on show and was delighted to have the honour of judging the first ever Borderway Agri-Expo. Black Beauty, a British Blue cross sired heifer and out of a Limousin cross dam, adds this top award to her other major outing of the season the Beef Expo 2007 held back in May. Tecwyn said “this new event has been well worth the journey north. Black Beauty is a super heifer and has retained style and conformation throughout the summer months. We will be back next year to compete at this major show”. The reserve championship award was presented to local show enthusiast Mr Neil Slack of Plumtree Farm, Penrith with his red Limousin cross heifer Rhiana. Sired by the registered Limousin bull, Cloughhead Titanic, she was purchased from the renowned Carlisle Autumn Suckled Calf show and sale in September from prominent producers Robert and Michael Scott of Thirlwall Castle, Greenhead. (Full prize list attached). The Solway Aberdeen Angus Club held their annual calf show which was judged by Mr Neil Massie of Blelack, Aboyne, Aberdeenshire. The Championship ticket was won by Messrs J & W Arnott of Haymount, Kelso with their heifer calf Haymount Wilmor a full sister to the 2006 calf champion. The sheep classes also attracted strong interest and judge Mr Alec Brown of Stonefieldhill, Rosewell, Mid Lothian commented that “for the first event there was an exceptional show of quality sheep forward for judging. The dressed sheep were very well presented, but the carcase of the lamb is also important. The show of sheep can only go forward and progress for another year and given the fact that there was more heavy weight lambs forward than light weights, exhibitors can prepare more in advance for next years show. “The event itself was just what people wanted at this time of year, there was a good buzz and a real friendly atmosphere”. The Champion pair of lambs were presented by husband and wife team James and Gillian Whiteford of Tercrosset, Brampton. Their untrimmed Texel cross lambs were greatly admired and caught the eye of the judge who commented that the Champion pair were full of conformation. The Reserve pairing were Beltex lambs shown by DR & DC Findlay of Birdridding Farm, Leyburn, who were the winners of one of the strongest classes forward on the day. The machinery demonstrations which took place attracted good interest. Throughout the day there was straw chopping and blowing demonstration along with silage feed wagon demonstrations. Another highlight of the days activities was the Auctioneering Expo Factor competition which was an event designed to let budding talent take the stage as auctioneers and impress the judging panel of Neil McCleary, Lynsey Clark and David McNeil. After some hilarious bidding the eventual winners were Stephen Graham of Millerhill, Gilsland winning the over 26 year old category and Mark Richardson of Croft House, Kirkby Stephen winning the under 26 age section. Our thanks go to sponsors David Allen & Co for their support. 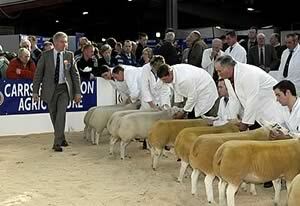 The Cumbria Young Farmers assisted with the organisation of arrangements for Stockjudging and Stockman of the Year. The judging event consisted of placing four beef cattle, four dairy cattle, four lambs and also answering an animal health questionnaire. The final results were announced and winning the Stockman of Year award was Ross Pattinson of Low Lunethwaite Farm, Wigton, second was Simon Case of Plumpton Cottage Farm, Ulverston, third was Richard Ridley, Woodhall, Hesket new Market and fourth prize went to Mark Curr of Bowderdale Head, Newbiggin-on-Lune, Kirkby Stephen. Plans for next year's event have already started and a final date will be announced shortly. Anyone wishing to be part of this exciting event please contact 01228 640924.